Participation in this vacation requires purchase of the following flights from Avalon Waterways, not included in pricing: (1) roundtrip air from your U.S. gateway and intra-vacation air segments; or (2) intra-vacation air segments only, starting at $130. 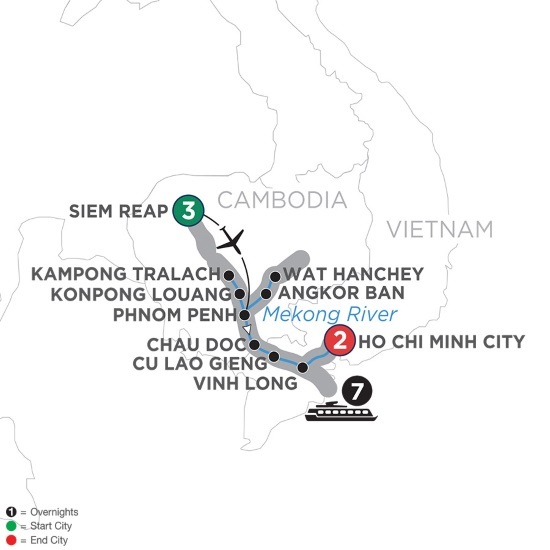 Required intra-vacation air segments: Siem Reap/Phnom Penh. Air prices were effective on February 6, 2019 and their availability is limited. At the time you purchase your tour, air prices may be higher. All prices are per person based on double room occupancy. Cruise price based on Category B in a Panorama Suite on Mekong Deck. To upgrade to a Category A on the Tonle Deck, add $400 per person or $800 in single occupancy.